I didn't see this sign when I was at the Target center yesterday, but I had seen a TwitPic of it on the #ObamaMN feed. 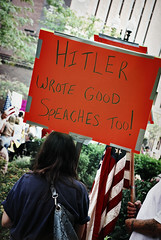 As the photographer said, "I don't care what your political views are, I cannot take you seriously when a) you compare healthcare reform to killing 6 million Jews and b) you cannot spell your protest signs correctly." Most of all the ones that I saw at the tax rally this last spring were spelled correctly, and had very good grammar. Proofread! always good when you are going to be at a national event, that might have your face on it. Firmly agreed on the photographer's sentiments.